"What we lost in the fire, we found in the ashes." That's a legendary quote from Denzel Washington in The Magnificent Seven, a great action-filled Western that does fall short of being a classic. The film is a remake of the 1960 film of the same name, which was also a remake of the 1954 Japanese film, Seven Samurai. Washington plays Sam Chisolm, a bounty hunter who is hired by Emma Cullen (played by Haley Bennett) & Teddy Q (played by Luke Grimes) to defend the town of Rose Creek from Bartholomew Bogue (played by Peter Sarsgaard), a corrupt industrialist responsible for killing many townsfolk, including Emma's husband, Matthew (played by Matt Bomer). Chisolm then sets out to find others to help with defending the town. 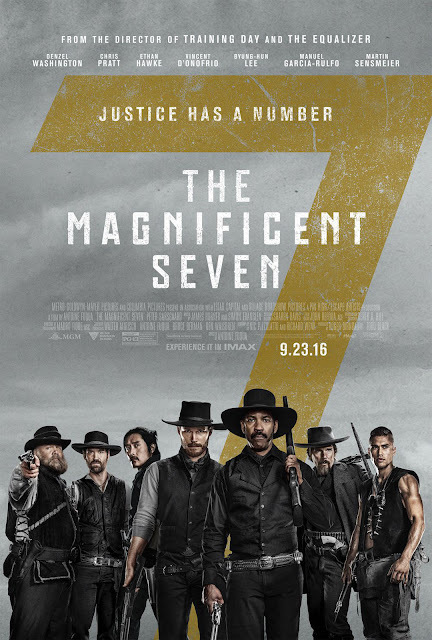 He finds 6 men to help him: gambler Josh Faraday (played by Chris Pratt); sharpshooter Goodnight Robicheaux (played by Ethan Hawke); tracker Jack Horne (played by Vincent D'Onofrio); assassin Billy Rocks (played by Byung-Hun Lee); outlaw Vazquez (played by Manuel Garcia-Rulfo); & warrior Red Harvest (played by Martin Sensmeier). Now, the seven must defend Rose Creek from Bogue & his men. The cast was great, especially Washington, Pratt & Hawke. The direction from Antoine Fuqua was great, along with the screenplay from Nic Pizzolatto & Richard Wenk. The cinematpgraphy from Mauro Fiore was excellent, with beautiful shots of the Western landscape. And the score from the late James Horner & Simon Franglen is amazing. While it does have a few misfires, it is still one of the best Westerns in recent memory.